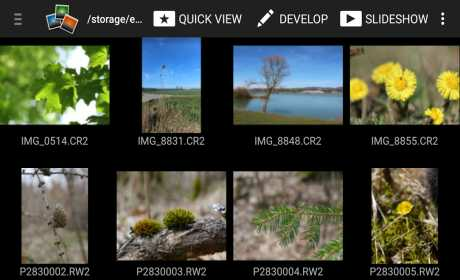 Photo Mate R2 is a complete raw-developer, image organizer and editor. It provides the most professional editing features for every photographer. 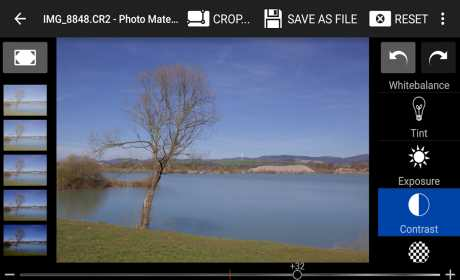 It supports full-size raw decoding of almost every camera-raw format (Canon CR2, Nikon NEF, Sony ARW, Pentax PEF, Samsung, Phase one and many more). You can also edit DNG-Images shot with your Android-phone. Please check www.photo-mate.com/cameras as well! Edit images in high-quality with all essential features including professional Noise-Reduction, Sharpening, Clarity, Curves, Vibrance, Lens-Corrections and much more. Use editing layers (gradient, circular, brush) to fine-tune specific areas of your images. All edits are non-destructive, you can always revert back to your original image. Export single images, a group of images or entire folders. Create export settings for specific scenarios (Full-Size, JPG, TIFF, or sharing on the web). Calibrate your tablet display within the app to make editing and viewing images more accurate. Never carry around your laptop again when you want to convert, organize or edit your raw-images. This app includes all the necessary tools for your mobile workflow – and even more!